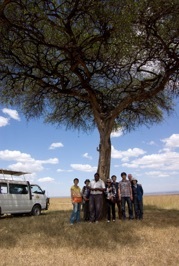 These pages are based on a visit to Kenya between 27 December 2008 and 4 January 2009. Since the centre of the experience was a Wildlife Safari to see the famous large animals of the East African Savannah, this also forms the centre of this report. From there, we expand to take in the birdlife we saw. Birdlife seems to be an incidental aspect of most Safaris for many visitors. Nonetheless, the quantity and variety of birdlife is astonishing. Although the migrations undertaken by the large animals of the Savannah are famous, the migrations of many of the birds cover much larger distances, and connect the environment of Kenya with Europe and Asia, as well as other areas of Africa. Most of us are familiar with the animals of the East African savannah through television, but the wonder and beauty of the wildlife of Kenya when experienced directly was on another plane altogether. In these pages, there will be reflections on the interaction between people and the savannah and its animals. There are also reflections on the state of Kenya as a country and its people. However, those who are not capable of being profoundly moved by the spectacle of the savannah wildlife are unlikely to be capable of being concerned by the state of the people of Kenya either. It is this linkage between the appreciation for the wonder of the raw natural world and the way of living of humans that forms the motivation for the matters presented in this site. Because of the dangers presented by the animals, and for reasons of preservation of the land, observation takes place almost entirely from the inside of a van. Accomodation is in Lodges which are quite luxurious and have facilities (clean running water, electricity, internet connections, astonishing quantities and varieties of food) which the average Kenyan would not know. As on the trip described here, most safaris involve no contact with ordinary Kenyans beyond the driver/guide and the lodge staff. Africans, too, stay at the lodges, but these are people who are extremely rich by the standards of their own country, not 'ordinary Kenyans'. Our trip took us for many hours along the roads linking the three sites we visited, and from inside the van we could see something of the country. So, a part of this site presents photographs of the people and their country as seen from this perspective, and reflections on what was seen, helped by information gleaned by questioning our driver, and from some reading. Now go to the Lodge and start your trip.